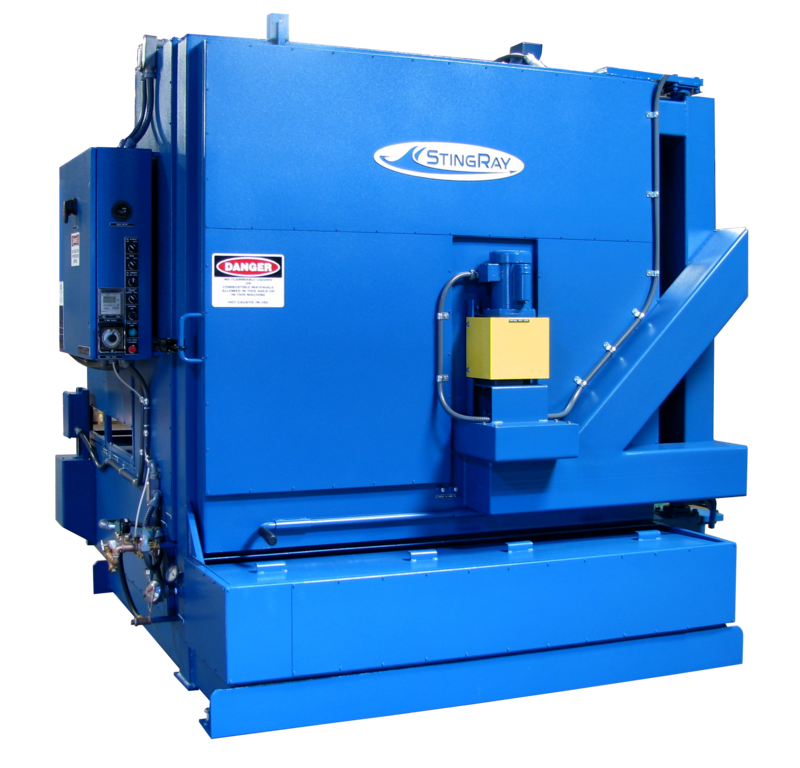 The Hot Air Blow Off (HABO) system speed dries parts by blasting them with high-velocity heated air in the parts washer at the end of a cleaning cycle. 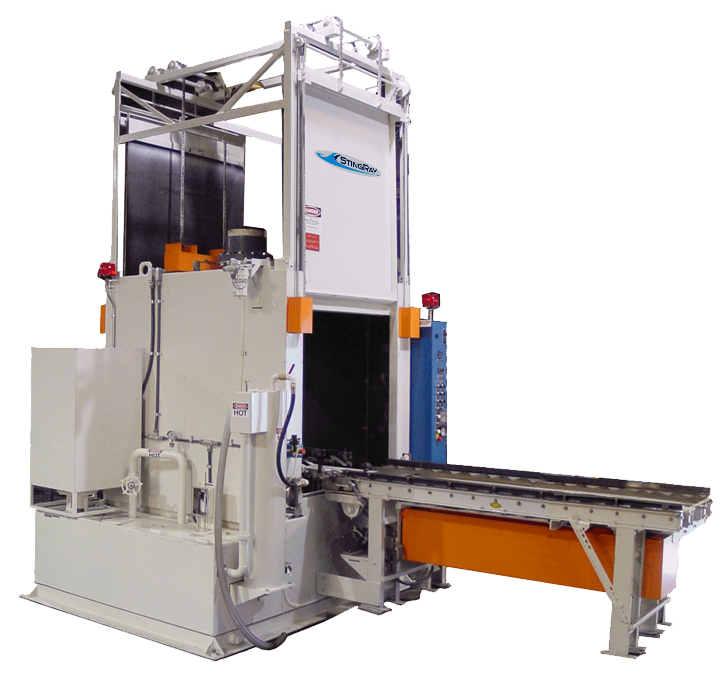 When dry parts are critical to the next operation the HABO is required to maximize the part flash drying function. While most surfaces flash dry, many parts have some pockets that retain water in pools. The HABO blows these pockets of retained water onto dry part surfaces. Heat evaporates the remaining water. The High speed steam exhaust pulls cool dry air into the cabinet to allow for quick evaporation of moisture from hot wet parts and prevents steam discharge from the cabinet. The dual speed exhaust blower allows for adjustment of the normal steam exhaust to minimize heat losses. The High velocity jet is as much or more important than the hot air to quickly dry parts. The high-velocity jet blows water off the parts or moves the water to hot surfaces for flash drying. Heat alone only dries by evaporation - a relatively slow process. The StingRay jet velocity exceeds 100 mph (161 kph)**. Carefully designed plenum ducts and large diameter jets extend the effective working range to 36 inches (914mm). By comparison, small diameter jets in other manufacturer's compressed air blow off systems only achieve a short working range. The effective range is approximately 30 times the nozzle diameter. For a 1/8" (3mm) diameter nozzle, the effective blow-off zone is only 3.75 inches (95mm). HABO systems are fully integrated with the StingRay parts washer and include a TEFC fan motor direct-coupled to a balanced pressure fan, a duct heater with over-temperature protection, High-velocity conversion nozzles set close to the edge of the turntable, and a two speed steam exhaust blower that switches to high speed during HABO operation. The steam exhaust blower speed is adjustable to set normal system speed so steam is just retained inside washer without excessive exhausting. This saves energy as the high heat content of the steam is usually the main energy loss in the parts washer. The HABO system activates after the wash and rinse cycles are complete. The Turntable continues to rotate throughout the HABO cycle. Air is pulled from outside the washer cabinet by the high pressure blower and forced through electric heating coils. The heated air accelerates to high velocity as it travels through the plenum and out the tapered HABO nozzles. Heating units are sized to provide heated air a minimum of 150° F (83° C) above ambient (enough heat to boil water and then some). A microprocessor based digital temperature controller that is front panel mounted and a high-limit temperature safety shutdown control completes the parts washer system.